State and government officials have issued messages in reaction to Sunday’s terrorist attack [in a famous nightclub] in Istanbul which claimed the lives of 39 people. President Mustafa Akıncı, the Speaker of Parliament Sibel Siber, Prime Minister Hüseyin Özgürgün and Deputy Prime Minister Serdar Denktaş all issued messages condemning the incident. The first reaction to the attack came from President Akıncı who condemned the attack via tweeter. “Istanbul unfortunately entered 2017 yet with another terror attack. We strongly condemn this brutal attack against innocent civilians at the club. We share the pain of the Turkish nation and express our deepest condolences” Akıncı tweeted. Parliamentary Speaker Sibel Siber who issued a message of condemnation stated that the incident once again deeply saddened the Turkish Cypriot people. She said that it was everyone’s desire to see an end to such attempts which were aimed at destroying peoples’ hopes for a year of peace and brighter future. Prime Minister Hüseyin Özgürgün in his message described the incident as a treacherous attack against innocent civilians. Condemning the attack, Özgürgün said that the attacker had targeted the Turkish nation but added that the Turkish people were aware of the games being played. He said that the Turkish nation will grow even stronger in the face of such attacks, stepping up its unity and solidarity. “Terrorism, no matter under which justification it is carried out, is a crime against humanity. These attacks aimed at disrupting the peace of the Turkish people will never succeed in achieving its goal. The attack that took place in Istanbul in the first hours of the New Year has deeply saddened the Turkish Cypriot people. We would like to wish our deepest condolences to all those who lost their lives and a speedy recovery to the injured” Özgürgün’s message read. 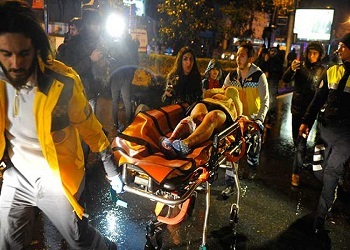 Deputy Prime Minister Serdar Denktaş who also issued a message condemning the attack stated that “those attempting to create chaos and to disrupt the people will never succeed in achieving their goals. The people of Anatolia will repel these treacherous attacks in unity”. Denktaş also expressed his deepest condolences to those who lost their lives and a speedy recovery to the injured. The Minister of Interior Kutlu Evren and the Minister of Public Works and Communication Kemal Dürüst also issued messages condemning the attack.